Embarking on a home improvement project is a fun and rewarding way to spend spare time. With a myriad of ideas available in books and on the Internet, ideas abound for quick makeovers that yield dramatic results and useful solutions. Claw hammer. Ensure you have this old standby for general assembly and demolition. Nail sets. You’ll need these in a variety of sizes to sink nailheads below the worksurface, providing for a clean finish. Coping saw. This saw has a very narrow blade stretched across a U-shaped frame. It’s the tool of choice for making curved cuts to wood. Tape measure. You’ll find it useful to have both a 12-ft. and a 25-ft. tape measure on hand. Cordless drill/driver. This portable power tool makes light work of drilling holes and driving screws. Levels. A 4 foot bubble level is best used on large surfaces – the smaller torpedo level works nicely in confined spaces. Combination square. This square is used to position hardware, such as hinges on doors, and to check right and 45-degree angles. Carpenter’s pencil. The pencil’s flat design keeps it from rolling off surfaces and it is used for marking and laying out hardware. Utility knife and putty knife. A utility knife will handle most cutting and trimming jobs. You’ll need a putty knife for filling holes and patching. Miter box. This tool is used with a handsaw to cut accurate 45-degree and 90-degree angles. The miter box is most often used for cutting trim and molding to length. Screwdrivers. 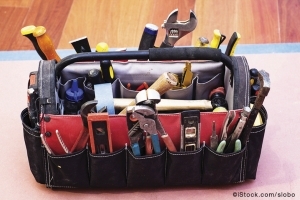 Your toolkit should include different sizes in both Phillips and Robertson. Or, you can consider at four-in-one screwdriver that holds four bits—two standard and two Phillips, which should meet most jobs. Safety gear: Eye and ear protection; dust mask or respirator; knee pads; work gloves; work boots; and, a good first aid kit. For best results, look for quality in the tools you select and invest in a tool bag or carry-all to keep your essentials well organized and easily accessible.